Armenians, summertime, and melons go hand-in-hand. Armenia is said to have some of the biggest, sweetest watermelon on the planet. I can’t swear that Florida watermelon tastes better than those grown in Armenia, but what we’ve eaten here so far this season has been pretty darn sweet. Why not kick back on your front porch or back deck with family, friends, and a bowl of refreshing fruit salad? This honey-lemon fruit salad is perfect for summer gatherings– it’s cool, sweet, tangy, and minty – all at the same time. The honey-lemon syrup can be made a day in advance for a quick-to-serve- dessert or snack. You can use any kind of melon you like, and add fresh seasonal berries for a special touch. 1. In a small saucepan combine the honey, water, lemon juice and zest. Over medium heat, bring to a boil, stirring now and then. 2. Reduce heat and simmer until mixture is reduced by half – about 5 minutes. 3. Remove from heat and cool syrup to room temperature. Set aside until ready to use. 1. 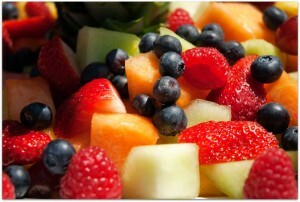 In a large bowl, combine the various melon cubes and berries. Drizzle the honey-lemon syrup on the fruit; gently toss to coat. 2. Place fruit in individual serving bowls. Garnish with chopped nuts of your choice, and chopped fresh mint leaves, if desired.